It all started in 2013, when Karlie Kloss got an "awkward length haircut" that somehow looked so good. It was called the the "Lob," a play on the words "long" and "bob." Others took notice and got a similar cut. Soon, the lob was the hottest haircut of that year, and since then, it has been the hair peg of women all over the world. If you aren't convinced yet, here are 20 celebrities who tried the lob. Style it with clipped back waves to enhance you bone structure. Having your hair end right above the shoulder will keep your lob haircut for months. Make it a bit messy for undone sexiness. Pulling one side back with tiny braids is not something you see every day. Keeping it sleek and shiny makes it a chic hairstyle for a strictly corporate environment. Lowlights add dimension to a blunt lob. You can always go back to black for a classic look. But if you dare to play with color, try a rose gold ombré. Channel bohemian chic with curtain bangs and tousled waves. Round face shapes can try a lob with wispy bangs and tousled waves to add definition to their soft features. Follow your hair's natural part for an extremely flattering look. Do an extreme side part if you want to slim down your face. If this doesn't convince you try a lob, we don't know what else can. This is solid proof that a blunt lob is the wearable cool-girl hairstyle you've been looking for all your life. Her fresh lob haircut suits her high cheekbones and sharp jawline. 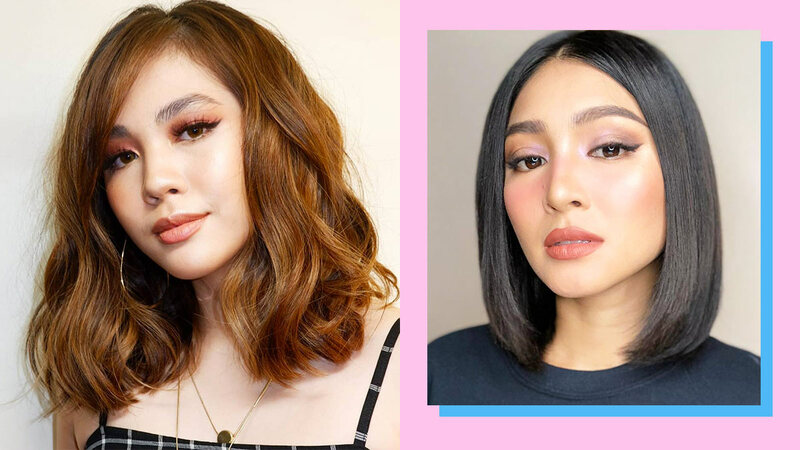 If you're looking for a very up-to-date cut, cop Nadine's "glass hair" and lob haircut. Create a deep side part and tuck the smaller section behind your ear to downplay full cheeks. Caramel hair color plus loose waves give a beach babe vibe. There's something about center parts and waves when it comes to lobs—they just work well together! Wear it sleek and straight with a middle part for an edgy appeal.